Not all mysteries begin with a gunshot ringing through the blackest night or a woman screaming bloody murder from afar. 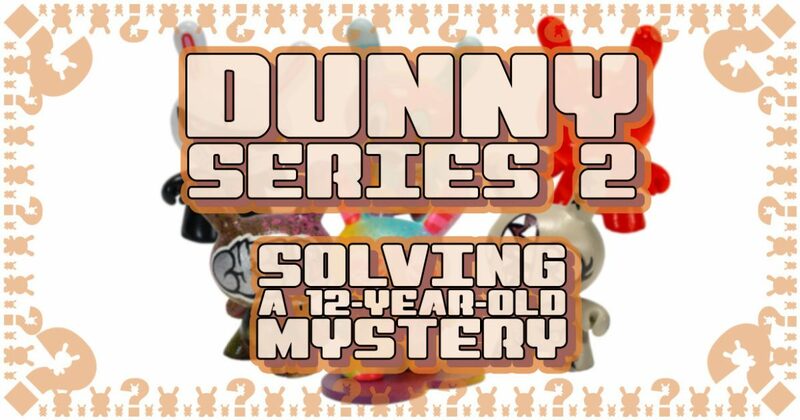 In fact, one of the most persistent mysteries within the designer toy movement started with the debut of 2005’s Dunny Series 2. Produced by Kidrobot, Dunny Series 2 contained more than the advertised 17 designs (plus 1 color scheme variant) within its blind assortment; randomly hidden within the boxes containing otherwise factory manufactured pieces were six unique hand-painted Dunny forms, which fans at the time proclaimed to be ‘golden tickets’ after the similarly hidden and rare ‘treasures’ from Charlie and the Chocolate Factory. And while all of these one-of-a-kind works were revealed at the time, the identities of the artists who created them have never been announced. Even Tristan Eaton, Kidrobot’s Director of Toy Design at the time, proclaimed himself “stumped” in regards to these. “I was fully involved with Series 2”, said Eaton, elaborating that he “designed the packaging, curated the artists, [and] delivered the turnarounds”, but even to him “the hand-painted variants are a source of mystery…”. Each of the six artists involved were provided a blank 3″ tall Dunny to hand paint, which occurred “before Series 1 even was produced”, recalled Kidrobot’s Marketing Director at the time, Nichole East (née Lindsay), also known as “The Baroness”. As for who conceived of the concept, Kidrobot’s founder and former CEO Paul Budnitz stated that the company’s then-Creative Director, “Chad [Phillips,] and I came up with the idea to get artists to hand paint some Dunnys and mix them in the boxes”, creating “an exciting way to make the art more REAL and connect more deeply with the artists we were working with and supporting!” Meant as a reply to those that were asking “are these toys or are they art?”, Budnitz attested that these hand-painted pieces were “our way of saying, ‘Both. '” But everyone interviewed was unable to remember who all six of the artists behind these works were, so the mystery remained… until, through perseverance, we solved it. The artist behind this first hand-painted Dunny contribution was the most obvious to identify, as he placed his well-known graffiti tag on its head. Created by Chris St. John, whose street art career under the guise of Cycle began in 1989, this piece exhibits the controlled chaos of his preferred style. Decorated with paint splatters, splashes, and drips, his alias’ iconic signature with its cartoonish face emerging from the ‘e’ identified him as the artist even before Budnitz, East, and Phillips confirmed it. Merging the mask element from his Dunny Series 1 contribution with the mouse-like nose, whiskers, and mouth of his Series 2 production piece, the obvious artist behind this second hand-painted work was Dr. Revolt, which was confirmed by both Budnitz and Phillips. An original member of the famous New York City graffiti crew Rolling Thunder Writers (RTW), the anonymous artist’s comic art influence exudes from this unique work of art. Andrea von Bujdoss, perhaps better known under her graffiti alias of Queen Andrea, admitted that “I created this customized Dunny over 10 years ago”. The New York City based graphic designer, illustrator, and street artist mimicked elements from her Dunny Series 2 production piece on her hand-painted work of art, notably the heart shapes, striped lines, and pouting lips. Primarily decorated with overlapping sprays of several colors, this piece was mounted on a heart-shaped base that was similarly painted. Even though “it doesn’t really match our Ms. Oonishi design that was in the series in any way”, stated the duo of Mike Doney & Katie Tang from the design studio TADO, “we do remember doing it a loooong time ago”. Depicting a feminine monstrosity with a vertical slit mouth, Doney & Tang admitted that “it looks very crude to us now but it’s definitely of its time in terms of the kinda muck we were drawing back then”. And that is what happened to these hand-painted pieces. While Kidrobot has no way to track who received these works, Budnitz confirmed that they were randomly inserted in the Dunny Series 2 assortment. “Not all of them were found by people who published they’d found them”, Budnitz professed, hinting to knowing more than he’s willing to reveal.